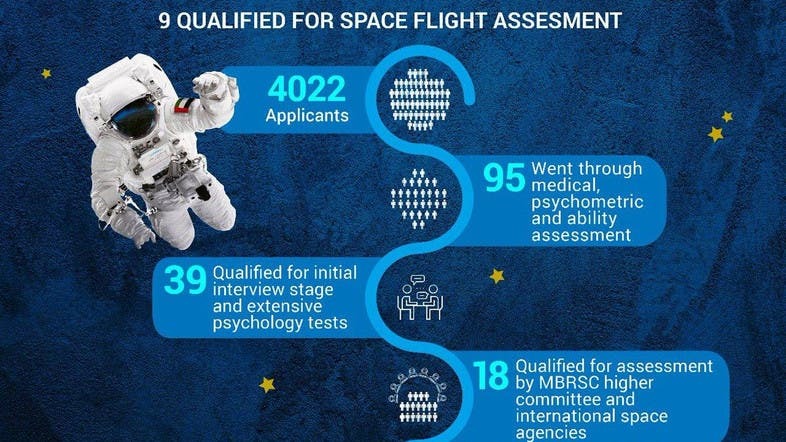 The Mohammed Bin Rashid Space Centre (MBRSC) has announced that nine candidates out of 4,022 applicants have qualified for the final evaluation phase of the UAE Astronaut Programme. Their qualification comes as part of the Center’s initiative to send the first Emirati and Arab astronauts to the International Space Station. While 4,022 people applied, only 95 were selected to go through medical, psychometric and ability assessments. Following the assessments, 39 applicants qualified for the initial interview stage, and had to undergo extensive psychological tests. MBRSC’s higher committee and international space agencies selected 18 people from the group to qualify for further assessments. The final nine were chosen to complete the last evaluation phase.